The Kitchen the heart of the home, especially during Christmas. 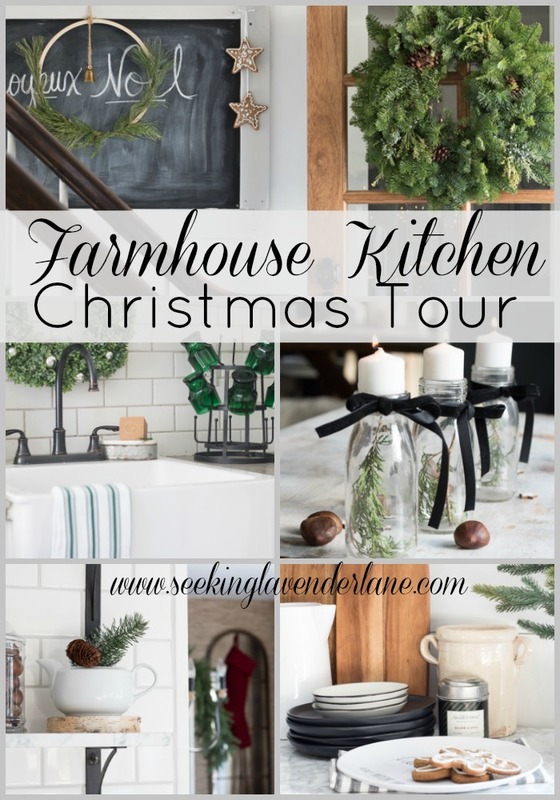 tour my Simple Farmhouse Christmas Kitchen. First, I would like to thank Marty, from A Stroll Thru Life for inviting me on this tour with her and the other amazing bloggers here. If you are stopping over from Remodalando La Casa…welcome! Wasn’t Cristina’s tour just amazing…she seriously is such an inspiration with her style…and I always love her seasonal tours. So, let’s get started here! I don’t know about you all but the Kitchen is where I feel the most festive. I love baking, making gingerbread houses, decorating cookies with the kids, and making some hot cocoa to settle into a good Christmas movie. 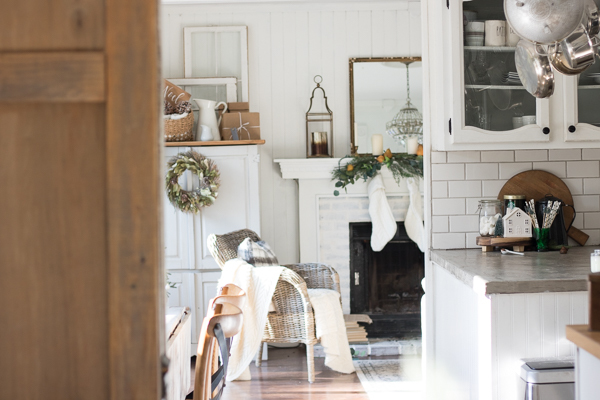 So this year for Christmas I decided to decorate with Simple Farmhouse Christmas Style. I was on this kick of keeping things natural and simple. 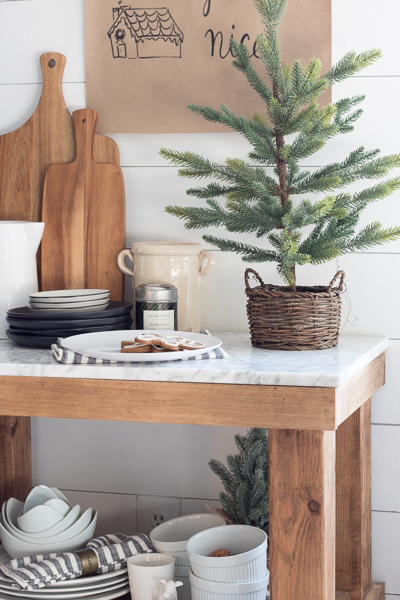 My inspiration was definitely a Scandinavian style Christmas with a black, white and green color scheme. Especially after landing some pretty green vintage glasses at the Country Living Fair back in October. You will also catch some of my tiny hallway pics here as well. My house is on the smaller side and I really like to share style and decor in a modest living space. I think design can be beautiful no matter what the size of your home. Working with boundaries like having a small boxy home…has its disadvantages, but it all still has potential. I hope this inspires you with decorating your home for Christmas. If you like what you see, be sure to Subscribe here. 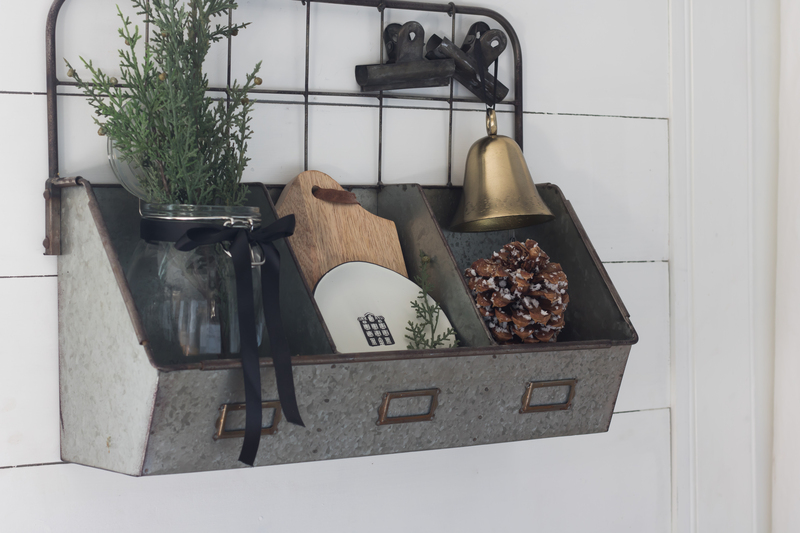 I share ideas weekly on creating a less cookie cutter home with my twist to Farmhouse Style. 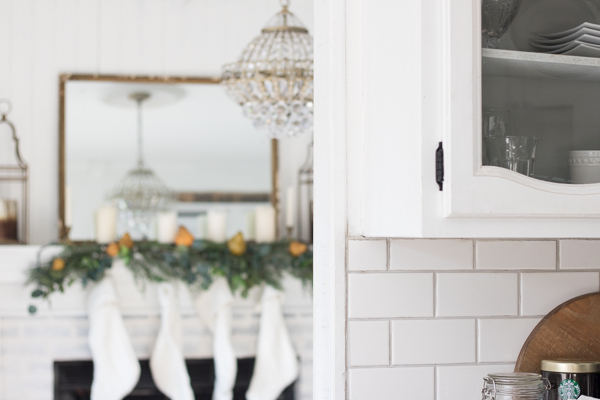 Sunday, I shared my Living Room and Dining room tour with Balsam Hill. You can see that here. Now for today’s post where we will be looking at a full tour of the Kitchen and a touch of the Hallway entrance. Grab that egg-nog and join me here! 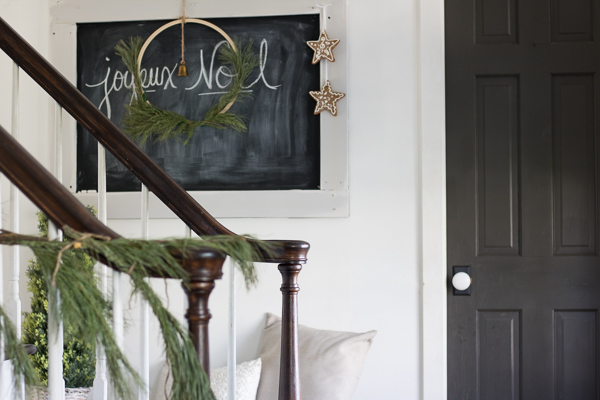 For the hallway decor, a simple Joyeux Noel on the chalkboard and some handmade crafts like the Embroidery Hoop wreath and some gingerbread cookies on a string. 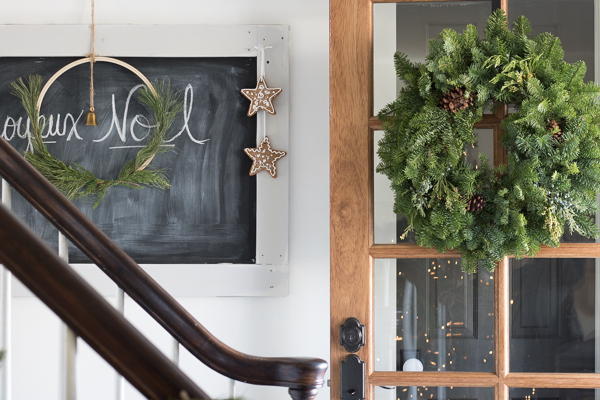 I attempted garland on the banister again this year but felt too crowded and chose to just stick to some drooped on the live room side of the banister instead of on both sides. 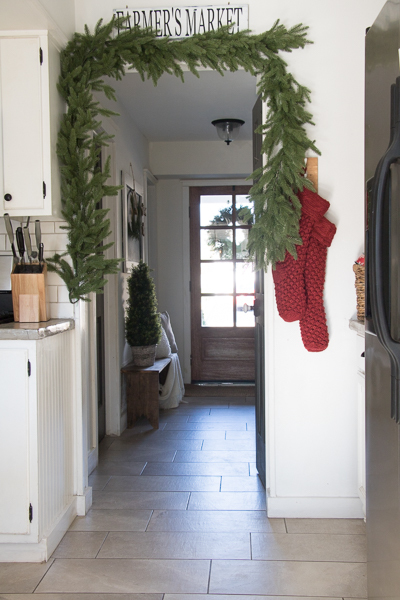 Into the Kitchen, you look to my hallway and some added garland and stockings make this view festive. And those green glasses I mentioned earlier in the post. Are they not amazing???!!! Get a similar look with these glasses here. 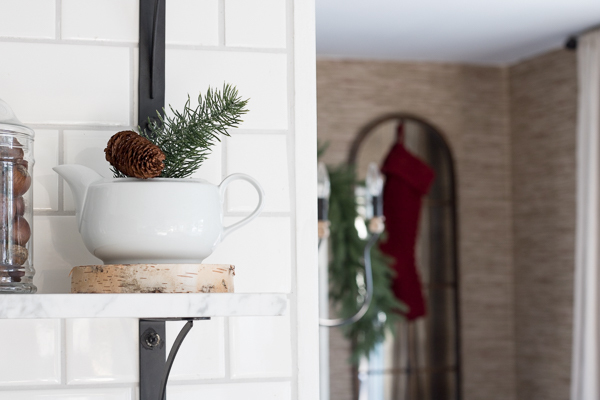 A hot Cocoa vignette which has come in handy a few times already this season. I decided the counter would be best for it this year since that’s where I prep my cocoa. Our Kitchen is squished between my family room and dining room. 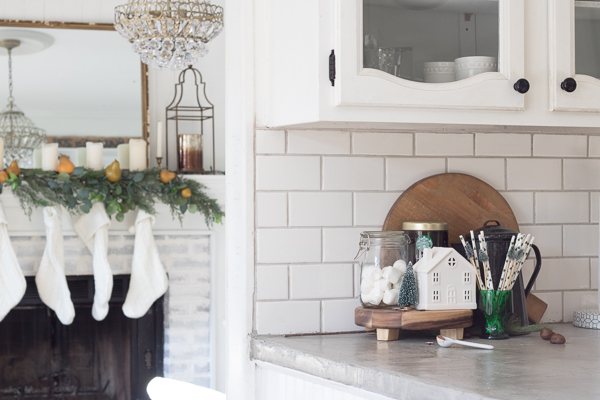 You can see more of my Family Room Christmas tour here, which I shared last month. The view from the dining room (behind the barn door) to the kitchen and family room. Do you spy our elf, snap? (lol I feel like he makes his appearance every year in my Christmas tour). 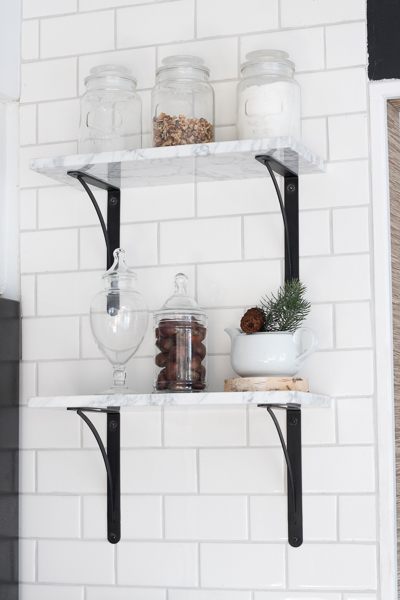 I added some chestnuts on display on our marble shelves for a simple nod to the Christmas look. My chippy Farmhouse table that I gave a makeover to, gets chippier every day. Thanks to some kiddos…but that’s what adds that character to this piece. I love not worrying about extra chips and scratches. Our bar cart has been switched up a few times so far…but I think this look is here to stay. 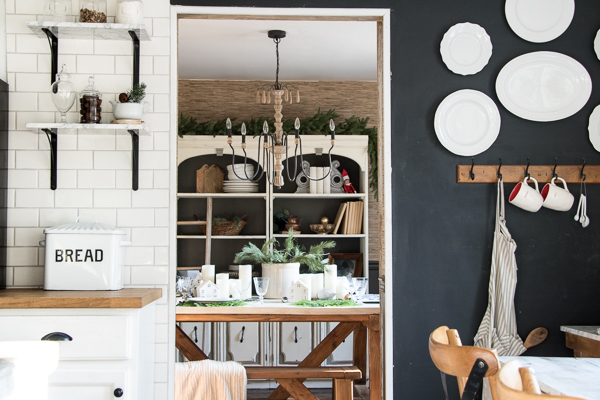 I love the black dishes from Hearth and Hand and that cute little Threshold tree. 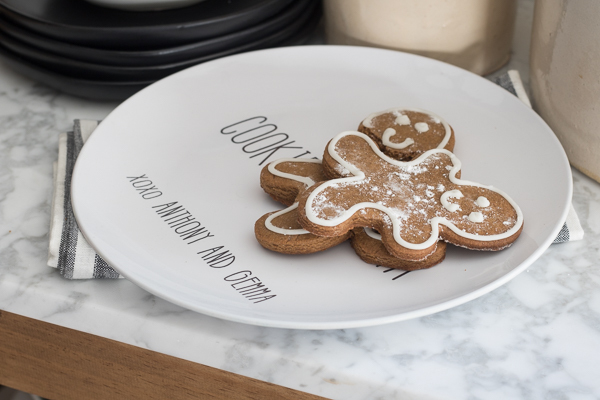 My Gingerbread lost his head…but how cute is this platter that says “Cookies for Santa” with my kid’s names. I got this specially made from Our Platter. Be sure to check them out and check my IG here tonight (12/5) for a coupon code to use by 12/6 and receive this for your cookie display to Santa. 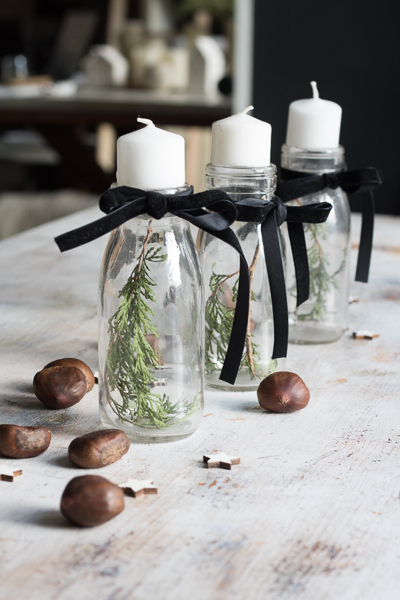 And a simple centerpiece that says Scandinavian Christmas! I hope you all enjoyed! Head on over to the other ladies tours and stop by the next home on the tour Laura’s home at Inspiration for Mom’s. Oh so pretty. 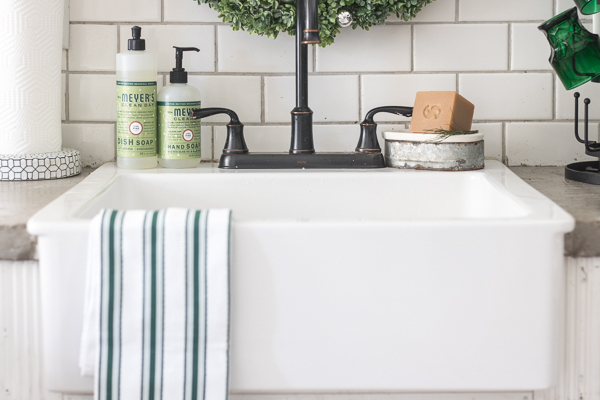 I love how you give Farmhouse an upscale and elegant touch, so pretty, warm and inviting. 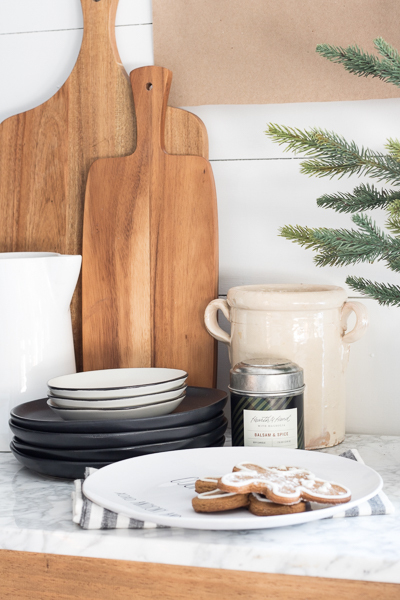 Your kitchen is fabulous, and those gingerbread men are perfect. Thanks so much for joining the tours, your home is full of ideas to inspire everyone. Thank you so much sweet Marty, I so appreciate that! So charming…..makes you want to come inside and visit! 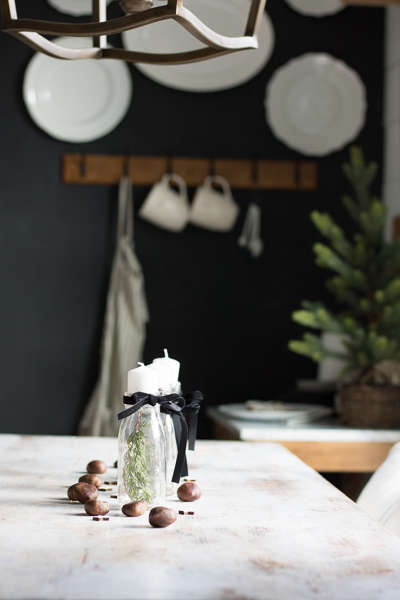 Thank you Bree, It’s an honor to be on this tour with you and your gorgeous home and blog. I love touring your house and getting beautiful ideas! Thank you for sharing!! Aww thank you so much Amber, I am so happy to hear that! Wish you a wonderful Christmas. Thank you so much Kimi! I enjoyed your tour so much! SO beautiful! Those little candle holders on the table are my favorite. Such a lovely vignette. This is just gorgeous! You decorate so beautifully, Deb!! 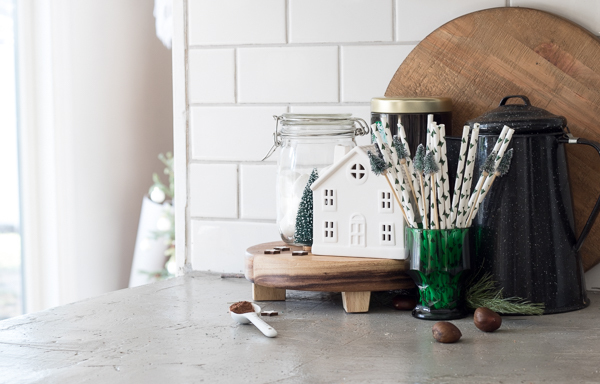 Where did you find the adorable tree straws for the cocoa station?!? Thank you so much, Jenna! I actually got those last year at the Target dollar spot. I wish they had them again this year. What a gorgeous home…you are a very lucky girl! thank you so much, you are so sweet! Deb your home has delighted my heart. 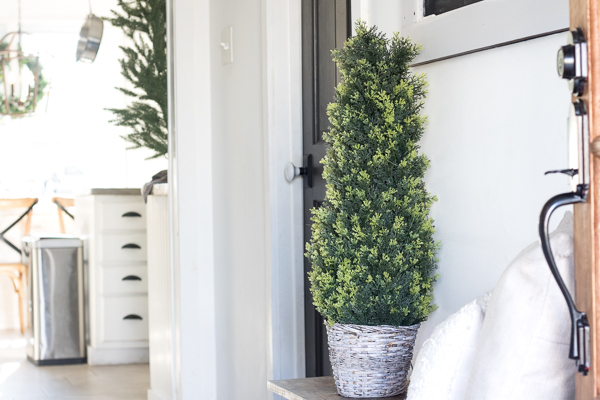 I adore all the touches of fresh greenery. It is a true gift to share this tour with you. Deb, your kitchen is so beautiful! 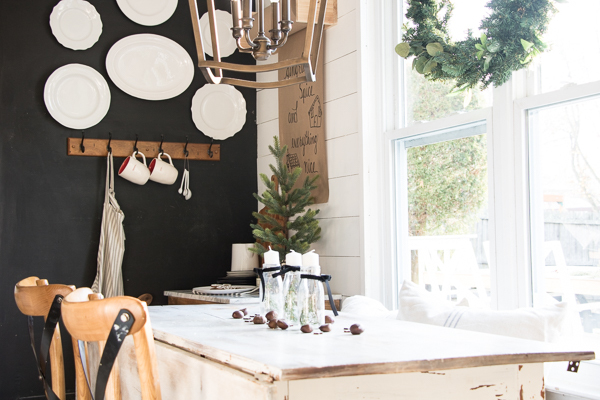 I love the open shelving, the dark color on the walls, that chippy table and of course, all the pretty touches of added for Christmas! 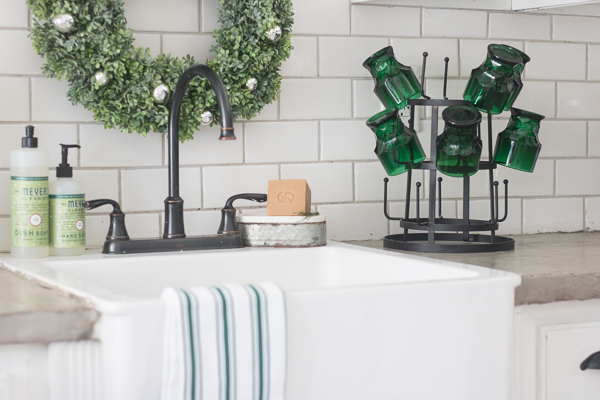 I just love the color scheme that you are using in your pretty holiday home. The black and green is so classic. Those green glasses are so pretty. I think I may have to add some to my kitchen. happy holidays. 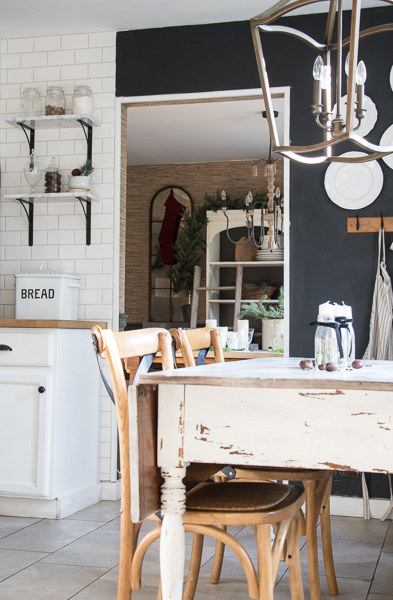 gorgeous farmhouse kitchen! Love the greens all around, and with the black, looks contemporary but still comfy! 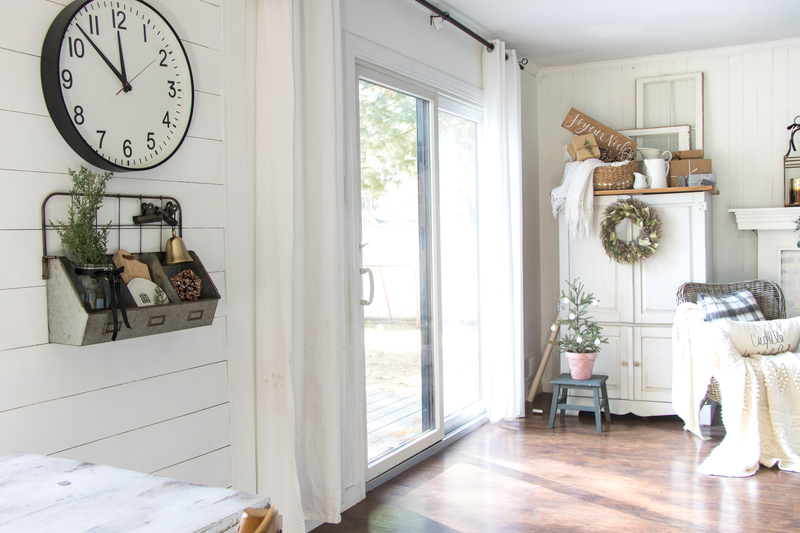 As always, honored to share this home tour with you! So pretty! I just love the simplicity of the black and green! Loved your tour! The black, white, and green is just stunning! Just got this post today!!!!!! So hope you will still read my comments aanswer my questions. What room has the black looking wall? What is the black on the wall? DETAILS, please!!!!!! 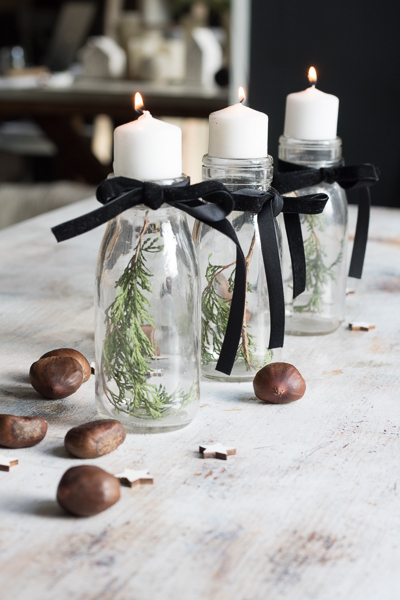 Love your simplicity of home decorating. Thank you so much!! The room with the black wall is in my kitchen. 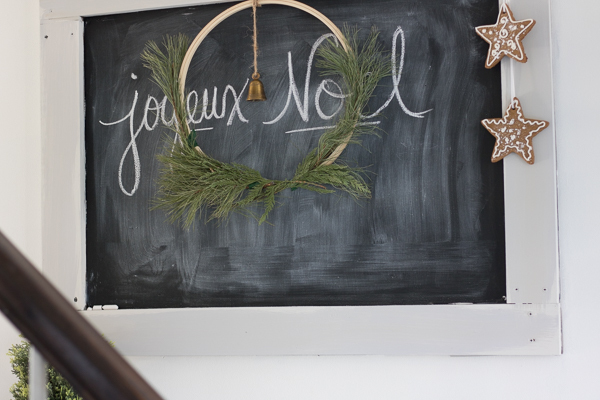 It’s near my kitchen table and I used chalkboard paint. I so appreciate your comment!